This book is the outcome of a difficult investigation, and a very remarkable story it is too. 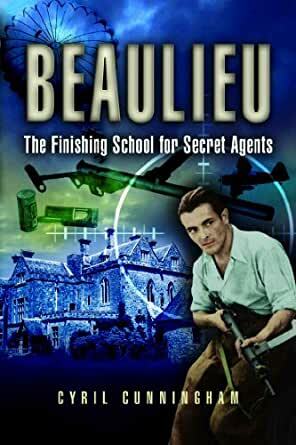 It was at Beaulieu that a large number of agents from Britain and the Nazi-occupied countries of Europe were trained in the delicate arts of secret inks, coding, clandestine communications and black propoganda, along with such nefarious skills as silent killing, housebreaking, safe-blowing, forgery, unattributable sabotage and survival techniques. And they were taught by some extraordinary characters including former spies, a professional burglar and the infamous Kim Philby, who played a significant role in the design of the curriculum. I found this book in the suggested reading list of another book. I was expecting some exciting stories and events surrounding the formation and activities of this training site. I couldn't even make it halfway through. Mr. Cunningham has obviously done quite a bit of research. There are a lot of details I can't wrap my head around the organisation of those details. That seems to be the crux of the problem. WIth the inclusion of the names of the buildings on the Matagu estate (what is it with those Brits and naming their homes? ), the changes in the labels (1st The Rings, then STS 31, then STS 36), the British names (first the title, the 3 initials and the last name; then later using the first (or nickname) and the last name), the physical descriptions (is it important that one guy was balding and another guy was portly?) the military abbreviations (If you forgot one of the definitions, you aren't going to find it again), and repeated information (yeah, yeah, the trainees were separated by nationality), this was worse than a school text book. Sorry Mr. C that all of your material wasn't edited into a more readable final draft. Fascinating look into the training of British spies in the Special Operations Executive during World War II. This is written by an actual SOE member. I found it fascinating at how meticulous and dedicated the British were in fighting for their country. The SOE was founded by Winston Churchill to proactively meet the enemy on foreign soil and use every method of subversion and subterfuge to defeat the Germans. I found it to be well-written and highly informative. I highly recommend it. Full disclosure: my uncle went through Beaulieu as did so many who were SOE agents in-training. My uncle died just before the war ended during his 2nd mission and no one in the family truly knew his story. This book sheds a lot of light, is superbly informative and very well written. The research is thorough and the account convincing. A lot of ink has been written on SOE and this book makes a useful addition as it highlights the importance of Beaulieu in the the history of the Second World War. For those who did not live through the war, we are always humbled and awed by the bravery of those who did. We must never forget! I was referred to this book by a Brit living in the area while I was visiting him. He showed me the areas and mansions mentioned in the book and asked if I knew the "secret" history of where the British trained their spies during WWII. It was a great way to make history come alive. It comes across as a "simple" book and almost "light" reading but the details that it brings forward must have been unbelievably difficult to find and verify. - spies do like to keep their secrets after-all. Good book about an obscure but interesting subject. I wish they could have dug more into the actual training. Geography just is not that interesting. The most interesting passage in the book to me far and away was the commandant's message to new recruits. And I think its on the last few pages of the book.